We are now well into 2017. If you are to develop a winning e-commerce marketing strategy you'll need to start planning now. E-commerce continues to grow rapidly, but with the huge market acting as a magnet to brands large and small, competition will ramp up faster than the total growth of the market. This means customers will be harder to win, easier to lose and fussier on price and user experience. To avoid falling behind the ever more fierce competition, you will need to both be aware of and benefit from the latest trends in e-commerce. These megatrends are global, have huge implications, and are not going to go away anytime soon. Ecommerce marketers will have to integrate them into their planning to be successful this year And if any of you think you can get away without creating a detailed plan - remember that 77% of marketing professionals think a planned approach focusing on analytics and continues optimisation is the most effect way of managing digital marketing, whilst only 14% thought a relatively unplanned, reactive approach was best. So make sure to consider these enormously important trends when creating your marketing strategy for 2017. 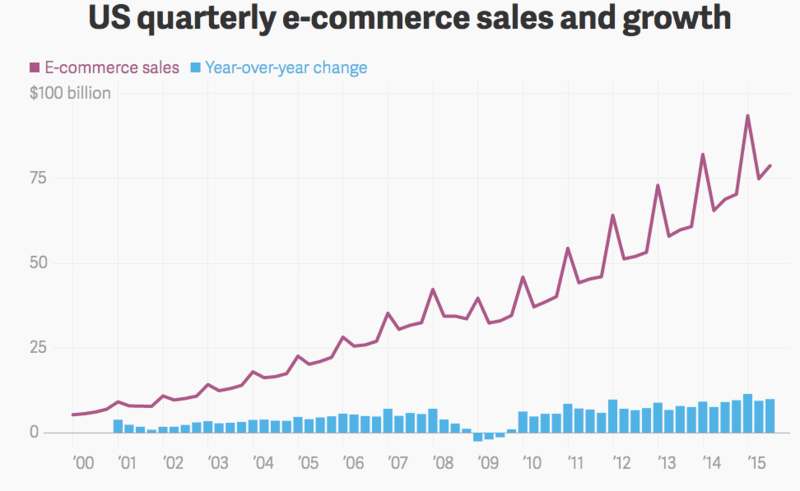 In the early days of e-commerce, it was the US that was the major driver of eCommerce growth. eCommerce has since become a global phenomenon, but the US has still been the most important market and key to driving growth. The chart below shows how consistent annual growth rates of around 10% have driven an explosion in US eCommerce sales over the past fifteen years. Although growth rates still remain strong, the US market isn't all that far off saturation point, so we can expect sales starting to plateau or the growth rates to at least slow slightly. This contrasts with Asian markets, especially China, where eCommerce sales are expected to continue their huge growth. The chart below showing the predictions of eCommerce sales growth shows China driving the overall growth, accounting for a huge chunk of global eCommerce sales. 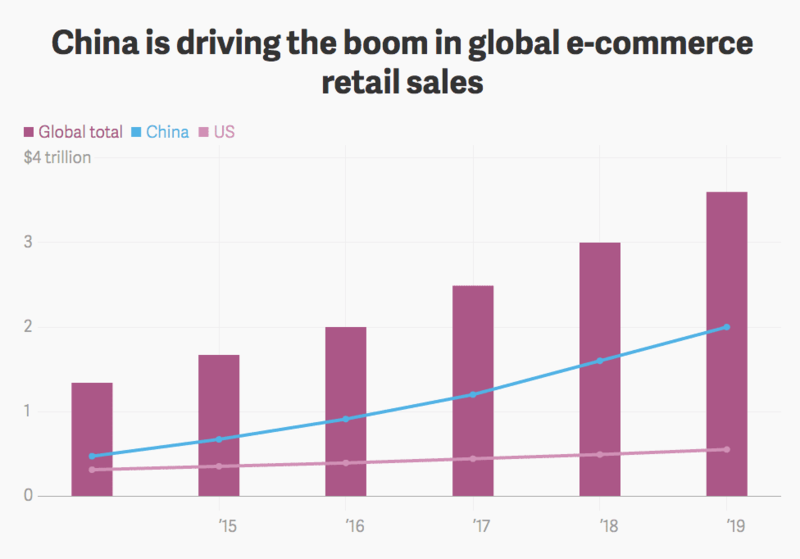 China's growth is so rapid that total eCommerce sales there are expected to double between now and 2019, adding $1 trillion dollars worth of additional sales in just three years! The huge shift in e-commerce growth towards Asia has massive ramifications for e-commerce brands. To take advantage of the trends they'll need to go international with their e-commerce - something easier said than done. The beauty of e-commerce is you don't necessarily need any physical infrastructure to start selling to a new country. With shipping rates cheap, international delivery becoming common and websites making borders increasingly irrelevant, it's not as hard as it once was to break into new countries and markets. However, that should not invite complacency. Well translated websites, strategies in tune with local expectations and the use of no VAT charges to subsidise delivery costs are all of critical importance. Because VAT is not charged on international sales, you effectively generate 20% more profit per purchase, (if UK based) or whatever % the sales tax in your country or state. This revenue can be used to subsidise the higher than usual cost of shipping for international customers. Trend 2. Mobile users continue to increase- but still aren't converting. Or are they? You don't need me to tell you about the shift to mobile over the past five years. 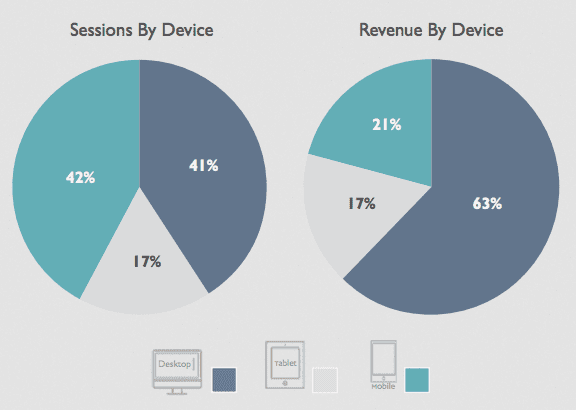 Mobile devices now make up over half of all web traffic and continue to grow in importance. This won't come as a surprise to anyone marketer that hasn't been in a coma since 2010. But it may surprise you that a very big chunk of customers still aren't happy with purchasing on a mobile device. Over half prefer purchasing on a PC, and many have privacy and security worries. New research from the 2nd half of 2016 confirms this picture. 80 million website sessions and data related to €230 million worth of online revenue were analysed by Wolfgang digital. They found that although mobile (phone and tablet) accounted for 59% of all sessions by device on e-commerce sites, these mobile browsers made up just 38% of revenue. Desktop was still dominating for conversion even though mobile browsing is the norm for research. The distinction was even bigger when it comes to high-cost purchases such as holidays. For online travel businesses, desktop made up just 41% of web traffic, but dominated sales, accounting for 67% of revenue. So what should e-commerce marketers make of the failure of mobile browser to convert? Simple: It's the omnichannel stupid. Mobile users are on the site to consider purchasing and make up their minds as to what products they want. As a result, they are extremely important and should never be ignored. The fact they then go to desktop to make the purchase does not mean you can neglect the mobile experience. Although Smartphones have the lowest conversion rate of any device, Wolfgang's correlation study found strong correlations between high percentages of mobile traffic and high overall website conversion rates. This seems like a contradiction in terms, but it is not. It's caused by people researching on Smartphones, making the key decisions related to the purchase, and then actually buying on a desktop later. Marketers need to stop thinking of 'mobile users' and 'desktop users' as different people. Because they're not. The average household has 7.4 internet connected devices. A 'mobile user' one minute is a 'desktop user' the next. The distinction is entirely artificial. A focus on brilliant mobile UX may help a few more mobile customers to convert without switching to desktop, but for higher value items the focus should be providing a seamless experience across devices so users can browse on mobile and convert on desktop. Research clearly shows people make key decisions about purchasing on their Smartphones, only to then purchase on desktop later. Your email strategy should reflect this. Send an email featuring products the user spent time looking at on a mobile device, as it may well be opened when they are on desktop and ready to convert. Thus providing the perfect slight nudge that leads to purchase. 2017 will be the year e-commerce competition gets racked up by another notch. New start-ups are entering the market and big established bricks and mortar brands are increasingly pushing to achieve significant chunks of the e-commerce market as consumers increasingly move online. 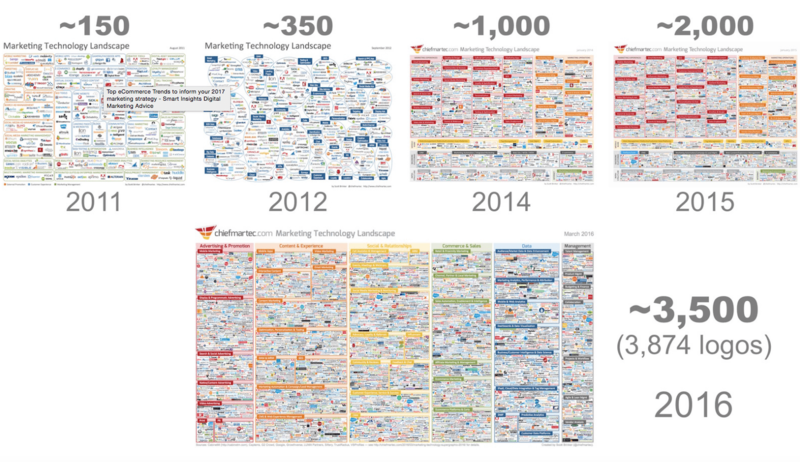 As competition builds, we're witnessing an explosion in mar-tech tools designed to help e-commerce marketers, as Scott Brinker's 2016 Martech graphic clearly shows. Whilst more tools are often helpful, growing competition will become a real headache for e-commerce marketers in 2017. 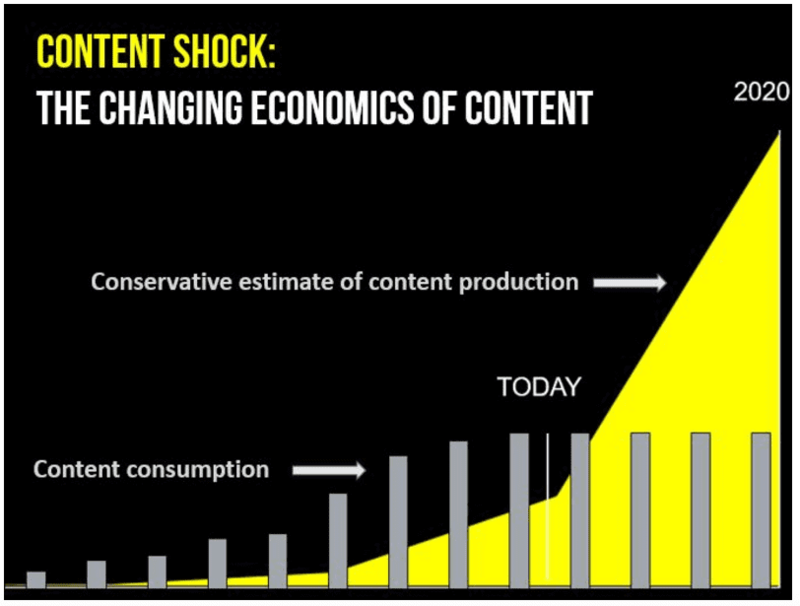 As Mark Schaefer has pointed out, content shock presents a real problem for anyone using content marketing, which includes a huge number of e-commerce companies. Most of the trends presented in this article are great news for e-commerce marketers, but growing competition and content shock is the exception. Competition for eyeballs will increasingly heat up, to the point where making a similar effort to 2016 will deliver far less gains in 2017. Good e-commerce marketers will need to produce exceptional content to manage to stand out in 2017. If they cannot do this, then focusing on tactics other than content marketing may be the best bet. If you are to be successful with content marketing for eCommerce in a world dominated by content shock, you'll need to employ a model which allows for innovative new types of content. Use the 70:20:10 model to structure your content marketing strategy so you spend 70% of time on content you know is effective, 20% on innovative new types of content and 10% of time on truly risk projects that could possible drive a major payoff. SaaS businesses have pioneered the subscription-based business model for software and show how effective it can be for both businesses and consumers. The flexibility it affords consumers and the recurring revenue it allows businesses is a massive win-win for both parties. That's what has driven it's massive growth over the past ten years, which is predicted to continue at a healthy rate as we head towards 2020. 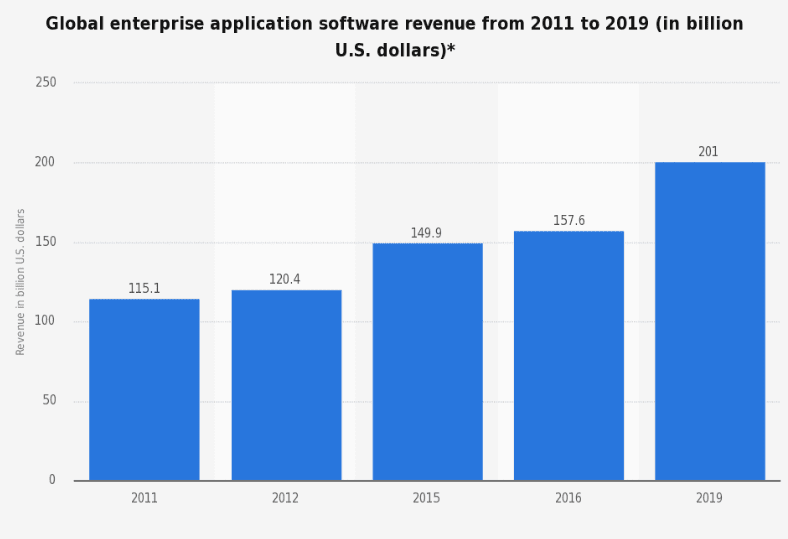 It's not just Software as a Service revenue that has exploded over recent years. Platform as a service is now one of the hottest trends in business. Just look at the incredible success of Platform as a Service businesses like Uber, Spotify and AirBnB. But subscription-based business models don't have to be limited to software. Recent years have seen the creation of many incredibly successful e-commerce businesses providing a physical product on a subscription basis rather than for a single fee for purchase. Founded just five years ago in 2011, the dollar shave club, a prime example of a subscription-based e-commerce site, is now worth an incredible $615 Million dollars! That's right. From nothing to $615 million dollars in five years. Just selling razors. With a subscription based revenue model it can be tempting to focus on getting more and more customers to convert and then watch the money roll in. But if you neglect them you will quickly find these customers cancelling and moving elsewhere. The key is a strong focus on retention efforts and constant investment in improving the product. When you look at revenue models, you'll find just a 2.5% change in churn rate can make a 30% difference in recurring revenue. It pays to keep your customers happy. All kinds of industries are ripe for disruption by successful subscription based e-commerce sites. And looking at economy-wide trends, it's clear this trend is set to continue. Millenials are increasingly keen to spread costs via subscriptions rather than making single big ticket purchase. Those in their twenties today have average incomes higher than those in their twenties did two decades ago, and have disposable incomes a third higher than the same age cohort did twenty years ago. But their wealth (the sum of their assets) is far lower than that of other demographics, and lower than their parent's wealth when they were in their twenties. Those between 20 and thirty are far less likely to own their own home or a car when compared to previous generations. If possible, consider selling your products via a subscription model. Anything that is used consumed regularly could successfully be sold via a subscription model, and in many cases already is. Examples include Beer, 'Meatpacks', 'Vegpacks', Meal kits, beauty products and snack boxes. The high disposable incomes of today's millennials means plenty of cash for subscriptions, but their low wealth means there is never much in the bank for big one-off purchases. There really has never been a better time to sell your product via a subscription model. This trend is much trickier to predict because it is genuinely new, rather than a continuation of trends which have been building for several years. 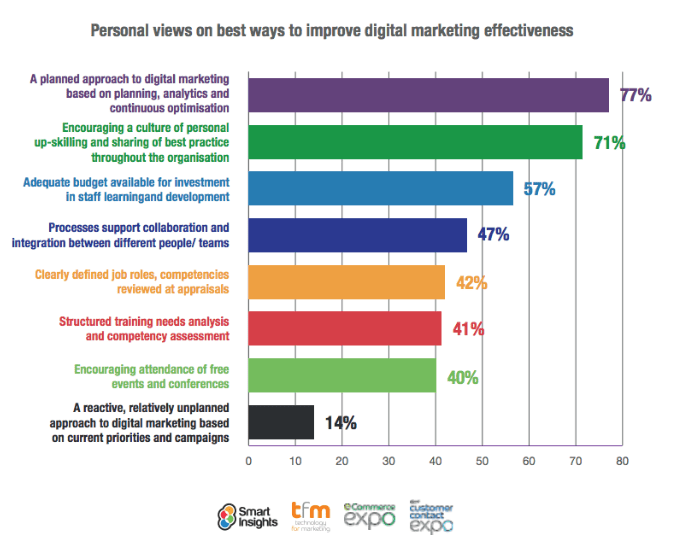 The increasing data available to marketers has massively increased their ability to target customers over the past few years, but increased ability doesn't instantly translate into increased effectiveness. Sometimes marketers can get too caught up in marketing speak and buzzwords and patting each other on the back, and fail to see what the consumer actually sees. What all this 'big data' and 'hyper-targeting' usually adds up to when I think about what I actually experience as a customer (rather than as a marketer) is getting served ads for products I've already bought. Generally, if I buy something online I'll get served re-marketing ads advertising the damn thing for a good few weeks afterwards. Cracking targeting - they got me stop on, I really did want that book of Nigella Lawson recipes. Thing is, I actually bought the thing, so it's actually the worst targeting in the world - I've never been less likely to buy it! So this targeting is precise and informed by data. But it's still stupid. What it needs to be is smart. That's the missing piece of the puzzle. That's where Artifical Intelligence comes in. 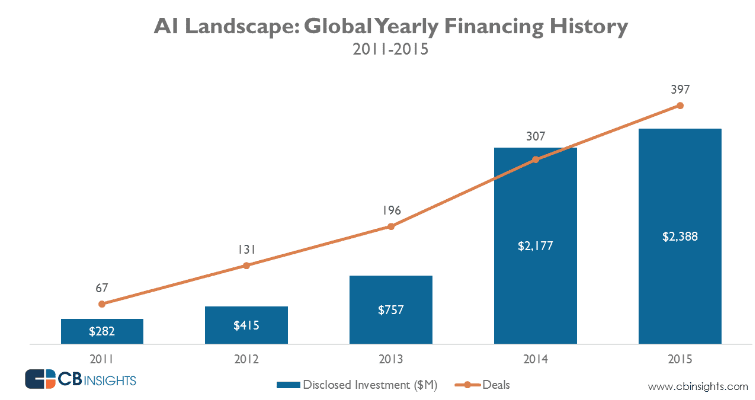 Funding for artificial intelligence start-ups has increased massively in the past three years. Data for Q1 2016 also shows the number of deals hit a quarterly record, and looks set for a considerable increase on the 2016 figure. My bet is the venture capitalists are onto something, and 2017 will be the year where AI tech really comes into its own. By combining genuine intelligence with the piles of data now available thanks to analytics and tracking software, ad targeting will be able to get a whole lot smarter. Moving beyond a simple 'customers that bought X also bought 'A, B and C' to a system which learns what makes each individual marketed to tick, and tailor messaging to exactly match what works on them. Marketers, especially those in larger organisations, should be looking at how AI tech can help with their ad targeting and personalisation strategy. 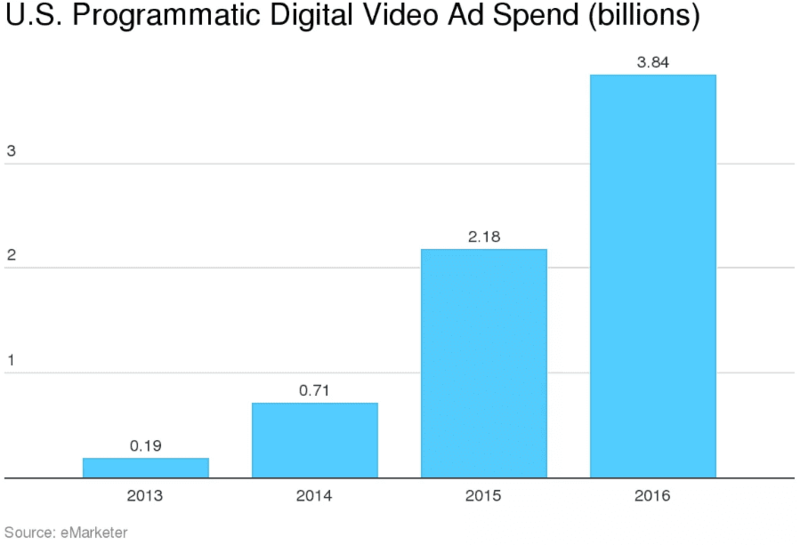 With IBM letting companies utilise it's famous Jeopardy-winning Watson AI system, and many other providers entering the market, 2017 will be the year digital ad-targeting gets smart. Chatbots are in many ways the most important breakthrough marketing technology of 2016- and are set to really come into their own next year. That’s not to say their necessarily the most important marketing tech trend of all, but many of the important trends like big data, VR, AI and the internet of things have been known for a few years now. Chatbots have been around since before 2016 as well, but it’s only this year that they’ve exploded in popularity and come to the attention of marketers. A bot is a piece of software that impersonates a user. In the past they have primarily been used for automating repetitive tasks, but they are now being developed for performing more complex functions. Chatbots imitates a person which you are able to communicate with. Chatbots are thus sometimes referred to as 'Messenger bots' as the conversation usually occurs with messaging apps. The below chart from Google Trends shows the explosion in search interest in ‘chatbots’ in April of this year and a general trend towards their greater interest over the course of 2016. The strict definition of at bot is any software that automates repetitive tasks over the internet, but that is so broad it includes all kinds of applications that won't concern marketers. The original bots were not tools for marketers, but rather things that got on their nerves. Think spamming Twitter accounts not run by humans, or bots browsing pages to inflate page views or ad impressions and thus scam advertisers. The good news is the new wave of bots are built to help marketers, not annoy or mislead them. Bots can act like a human helper, but without the cost of hiring the human. This opens up a whole load of opportunities. For example, a bot on a travel site could ask you about your preferences, provide you with some personalised hotel options, compare prices and then book the one you liked best for you. Don’t invest in building Chatbots just because they are the latest marketing gimmick. Put yourself in the shoes of the customer and conduct market research to establish what pain points customers have in terms of customer service or friction along the user journey. If a Chatbot could be helpful in alleviating some of that friction, then you know it is worth investing in. Chatbots are currently an emerging technology and as such many can only perform a few rudimentary tasks. But their capability is growing quickly. In September 2016 Facebook added in-app purchase functionality to its messenger platform to allow bots to complete purchases for users entirely within the platform. Soon this kind of functionality will become the norm rather than new and experimental. eCommerce businesses will have to get used to utilising chatbots to smooth customer journeys, or else see their customers move elsewhere. Shoppable video isn't brand new. It was launched by YouTube in late 2015 and has been gathering momentum throughout 2016. However, in its current form, it isn't actually all that impressive (Sorry YouTube, but it just isn't). Simple little cards that pop up to let you buy items in a video isn't exactly mind blowing tech. Video creators have been able to overlay links on videos for years. However, my bold prediction if 2017 is that this is going to change. Either YouTube or another provider will merge the technology that can create programmatically generated personalised video, and the tech needed for shoppable video. We've seen an explosion in the use of programmatically served video in the past few years, and by combining this trend with new tech like shoppable video and personalised video, we will see a massive change in how eCommerce marketers sell via video. This merged offering will be far superior in terms of its usefulness to eCommerce marketers. By programmatically placing products in a video based on known customer preferences, and then making it shoppable, eCommerce advertisers will be able use it to convert customers like never before. I don't have a graph to back up this trend because it doesn't exist yet- but it's such an obvious next step in where video technology is going is only a matter of time before it is realised. And once it is, it'll be the hot new eCommerce ad format- don't say I didn't warn you! eCommerce is a rapidly growing field which has to respond quickly to the latest trends. The low barriers to entry and the fact consumers can switch providers effortlessly means those that fall behind when it comes to customer experience and pricing strategy quickly loose out. Those in charge of developing eCommerce marketing strategy in 2017 should thus pay close attention to these 7 major trends. Structured on the RACE framework, this guide explores the latest E-commerce marketing trends looking ahead to 2017. From the latest social media, content marketing and user experience trends, we explore what E-commerce marketers need to be thinking about throughout 2017.